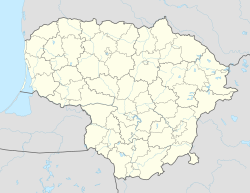 Šilutė ( pronunciation (help·info), previously Šilokarčiama, German: Heydekrug)(also known as Heydekrug) is a city in the south of the Klaipėda County, Lithuania. The city was part of the Klaipėda Region and ethnographic Lithuania Minor. Šilutė was the interwar capital of Šilutė County and is currently the capital of Šilutė District Municipality. Šilutė's origin dates to an inn (Krug, locally karčema) catering to travelers and their horses which was located halfway between Memel (Klaipėda) and Tilsit (Tilžė). The German name of Heydekrug referred to a Krug (an archaic word for inn) in the Heide (heathland). The inn was known for being in the region where most people spoke the Memelland-Samogitian dialect Šilokarčema. A famous fish market was opened in Šilutė almost 500 years ago, when Georg Tallat purchased the inn together with the land and fishing rights in 1511. The town was a gathering place for peasants from nearby Samogitia and Curonian and Prussian fishermen from Rusnė, Karklė [lt], Nida, and Lesnoye [de]. Next to the inn a church of Werden (Verdainė) was built in 1550. Heydekrug often sought city rights, but was opposed by Memel and Tilsit in 1721 and 1725. In 1722 Heydekrug became a district center and in 1818 the capital of Landkreis Heydekrug. The settlement was amalgamated with the villages of Werden (Verdainė), Szibben (Žibai), and Cynthionischken (Cintjoniškiai) in 1910, although it still did not receive city rights. Following World War I, the town became part of Lithuania when it acquired the Klaipėda Region in 1923. The town was reclaimed by Nazi Germany in 1939 when it reacquired the Memel Territory. In 1941 the town finally received city rights. During World War II, the Stalag Luft VI prisoner-of-war camp was located near Heydekrug; it was the northernmost POW camp within the confines of the German Reich. There remain many old buildings in Šilutė: an old post office (1905), a fire station (1911), a court building and prison (1848), a bridge across the Sziesze (Šyša) (1914), an estate of H. Scheu (1818), an old market square, a harbor, railway station and a bridge (1875), and the Vydūnas gymnasium. The town, which is a regional center, has a well-developed infrastructure. There is an amateur theatre, a museum, three churches, a few hotels, and many cafés, restaurants, and bars. There are large industrial enterprises in Šilutė as well: Šilutės Rambynas (1842), producing butter and cheese, is one of the oldest factories in the area; Šilutės Baldai (1890); and Šilutės Durpės (1882) which exports approximately 50,000 m3 of peat. Newly founded enterprises are also prospering: Šilutės Girnos (combined fodder); Žibai; Grabupėliai (meat processing); and EKSA, a subsidiary of the alcohol producer Stumbras. In order to speed up capital investments, the region council has established land tax bonuses for investors. Doris Nefedov maiden name Treitz (1942–1969), German singer under the stage name "Alexandra"
Wikimedia Commons has media related to Šilutė.